Microsoft recentlyreleaseGeneral Availability (GA) of Microsoft Flow, a cloud-based automation platform that provides workflow and connectivity across multiple popular online and on-premise services. 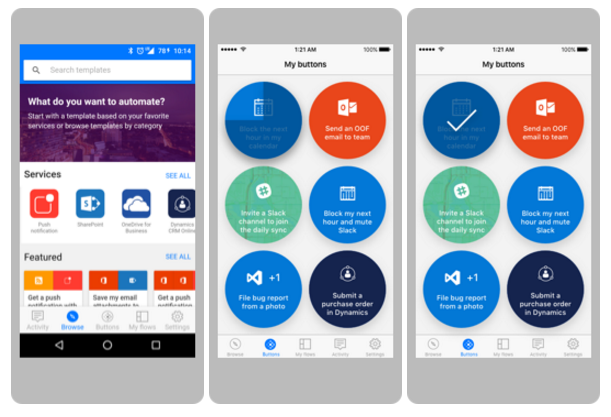 Microsoft has been inApril 2016Released a preview version of Microsoft Flow, and since then, 17,000 people from 61,000 organizations in 139 countries have used the service. At the time of release, Microsoft Flow supported 42 languages ​​and crossed 6 regions, achieving a 99.9 percent SLA. Over the past decade, we have witnessed explosive growth in the use of the cloud. Nowadays, we can do almost everything from the Web, from the purchase of cars to the submission of expense reports, from personal life content to work tasks, all via the Web. These cloud solutions have a huge advantage - mdash; mdash; can be easily registered, quick to use and run well on mobile devices. One difficulty, however, is that each service is running in its own silo. & Mdash; If you need to do more than one service, the data from one service to another will be Very challenging. Microsoft Flow solves these connectivity issues by providing an automated platform that allows us to assemble different services, including Office 365, Dynamics 365, Yammer, Instapaper, Pinterest, Slack, and Salesforce. In addition to these online services, Microsoft Flow can also connect to on-premise platforms, including SharePoint Server and SQL Server. The connection between them is throughMicrosoft on-premise data gatewayTo achieve. This is also used by other cloud-based Microsoft services to implement communication functionsGateway, Such as Azure Logic Apps, PowerApps and Power Bi. It allows us to create environments, manage permissions, and build Data Loss Prevention (DLP) policies. This allows the administrator to define which service-related business data can be shared. For example, an organization that uses Flow may not want their business data stored in SharePoint to be published to a Twitter feed. Microsoft Flow is available through both free and paid services. Free plans have a few restrictions on the number of executions per month, the frequency of process execution, and the available connectors. The fee-based version allows for more operations per month and higher frequency of execution and the ability to use additional connectors, such as Salesforce and on-premise connections. Microsoft Flow is also available in the Office 365 and Dynamics 365 subscription plans. Please refer to Microsoft FlowPricing pageLearn more.